The landmark 2008 statute requiring integrated regional housing and transportation plans that accommodate each region’s housing need while striving to attain greenhouse gas reduction targets. Senate Bill 375 (Steinberg): SB 375 became law in 2008. It includes two main statutory requirements and a host of voluntary measures. It is designed to complement AB 32, which requires the state to reduce its GHG emissions to 1990 levels by 2020. The first requirement is to reduce per-capita carbon dioxide (CO2) emissions from cars and light duty trucks, primarily by building more compact communities with better access to mass transit and other amenities, so people have more transportation choices and do not have to drive as much. The second requirement is to house 100 percent of the region’s projected 25-year population growth, regardless of income level. SB 375 supports California's climate action goals to reduce GHG emissions through coordinated transportation and land use planning with the goal of more sustainable communities. Under the Sustainable Communities Act, ARB sets regional targets for GHG emissions reductions from passenger vehicle use. 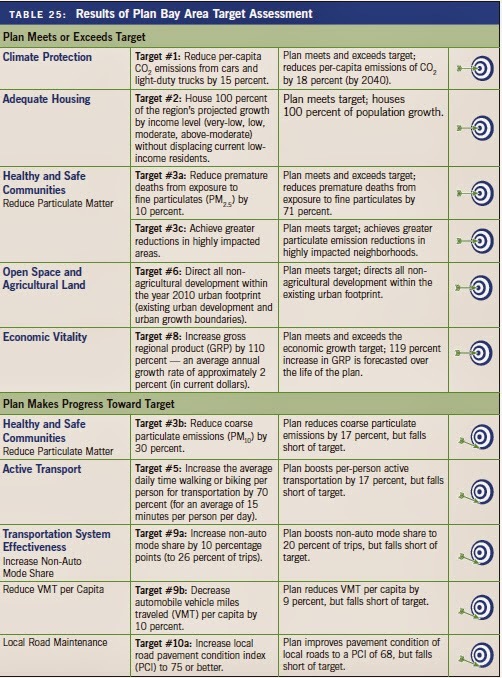 In 2010, ARB established these targets for 2020 and 2035 for each region covered by one of the State's MPO's. ARB will periodically review and update the targets, as needed. Each of California’s MPOs must prepare a "sustainable communities strategy" (SCS) as an integral part of its regional transportation plan (RTP). The SCS contains land use, housing, and transportation strategies that, if implemented, would allow the region to meet its GHG emission reduction targets. Once adopted by the MPO, the RTP/SCS guides the transportation policies and investments for the region. ARB must review the adopted SCS to confirm and accept the MPO's determination that the SCS, if implemented, would meet the regional GHG targets. If the combination of measures in the SCS would not meet the regional targets, the MPO must prepare a separate “alternative planning strategy" (APS) to meet the targets. The APS is not a part of the RTP. AB 32 - The California Global Warming Solutions Act of 2006; state legislation requiring a statewide reduction in greenhouse gas emissions to 1990 levels or lower by the year 2020. APS - Alternate Planning Strategy - If the combination of measures in the SCS will not meet the region’s target, the MPO must prepare a separate “alternative planning strategy (APS)” to meet the target. The APS is not a part of the RTP. The fact that an SCS is subject to the fiscal constraints of the RTP could certainly affect feasibility. For example, an MPO’s modeling work might reveal that building 100 miles of grade-separated rapid transit (and implementing associated land use changes) would allow the region to meet its target. But if the region cannot fund more than 10 miles of rapid transit, it is not appropriate for the SCS to depend on the full 100 miles in order to meet the GHG reduction target. In the event that an SCS is unable to meet ARB’s regional target, the MPO must prepare an APS that will meet the target. The APS should explain what barriers exist to meeting ARB’s target, and then present other ways the region could leverage land use and transportation tools that allow the region to achieve the target. Although those tools must be somehow “practicable,” the APS is an opportunity for an MPO to be more visionary about the future of its region. CEQA - California Environmental Quality Act - Requires that the potentially significant environmental impacts of planning efforts and specific projects be analyzed, along with measures that mitigate those impacts, and alternatives that may reduce the environmental impact. RTPs, general and specific plans, as well as particular transportation and development projects, are all subject to CEQA. CMAs - Congestion Management Agencies: Countywide agencies responsible for preparing and implementing a county’s Congestion Management Program. CMAs came into existence as a result of state legislation and voter approval of Proposition 111 in 1990. Subsequent legislation made them optional. Most Bay Area counties still have them. Many CMAs double as a county’s sales tax authority. 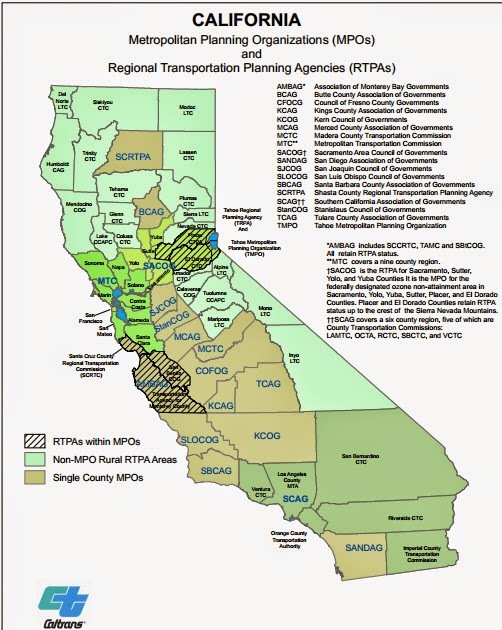 MPO - Metropolitan Planning Organization - .Federally mandated and federally funded transportation policy-making organizations that are made up of representatives from local government and governmental transportation authorities. Congress created MPOs in order to ensure that existing and future expenditures of governmental funds for transportation projects and programs are based on a continuing, cooperative, and comprehensive (“3 C”) planning process. The governor designates an MPO in every urbanized area with a population of over 50,000. In other words, the federal government wished to see federal transportation funds spent in a manner that has a basis in metropolitan region-wide plans developed through intergovernmental collaboration, rational analysis, and consensus-based decision making. MPOs form the regional level of governments, occupying the space between local governments and the State. MTC is the Bay Area’s MPO. Eighteen MPOs are designated in California, accounting for approximately 98% of the state’s population. The jurisdictions of these MPOs vary widely throughout California. In some cases, multiple counties that are seen as part of the same metropolitan region are grouped under a single MPO. These include the Metropolitan Transportation Commission & Association of Bay Area Governments (MTC/ABAG for the 9-county Bay Area), the Southern California Association of Governments (SCAG for 6 counties, including Los Angeles), the Sacramento Area County of Governments (SACOG for 6 counties, including Sacramento), and the Association of Monterey Bay Area Governments (AMBAG, for Monterey, Santa Cruz, and San Benito counties). In many other cases, MPOs split along county lines; notable examples include San Diego Association of Governments (SANDAG for San Diego County) and the 8 single-county MPOs in the San Joaquin Valley. Each of California’s 18 MPOs then prepare a "sustainable communities strategy (SCS)" that demonstrates how the region will meet its greenhouse gas reduction target through integrated land use, housing and transportation planning. One Bay Area - A new initiative meant to coordinate efforts of the Bay Area’s regional government agencies — the Association of Bay Area Governments (ABAG), the Bay Area Air Quality Management District (BAAQMD), the Bay Conservation and Development Commission (BCDC) and the Metropolitan Transportation Commission (MTC) — in partnership with the region’s 101 towns and cities to create a more sustainable future. 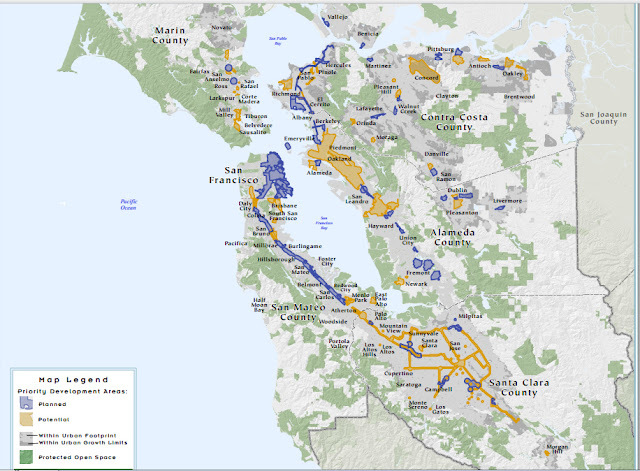 One major effort now underway is the development of Plan Bay Area, the region’s long-range plan for sustainable land use, transportation and housing. PCA - Priority Conservation Area - Regionally significant open spaces for which there exists a broad consensus for long-term protection and for which public funds may be invested to promote their protection. These areas must be identified through the FOCUS program. PDA - Priority Development Area - Locations within existing communities that present infill development opportunities, and are easily accessible to transit, jobs, shopping and services. Local jurisdictions identified these locations voluntarily through the FOCUS program. Plan Bay Area provides a strategy for meeting 80% of the region’s future housing needs in PDA's which represent about five percent of the land in the Bay Area. These are neighborhoods within walking distance of frequent transit service, offering a wide variety of housing options, and featuring amenities such as grocery stores, community centers, and restaurants. Identified by cities and towns across the region, the PDAs range from regional centers like downtown San Jose to suburban centers like Walnut Creek’s West Downtown area, and smaller town centers such as the Suisun City Waterfront. The Plan funds mixed-income housing production and locally-led planning in PDAs. Plan Bay Area - In July 2013, MTC and the ABAG Executive Board jointly approved both the final Plan Bay Area — which includes the region’s Sustainable Communities Strategy and the 2040 Regional Transportation Plan — and an associated final Environmental Impact Report. RNHA - Regional Housing Needs Allocation - A state mandate regarding planning for housing in California. 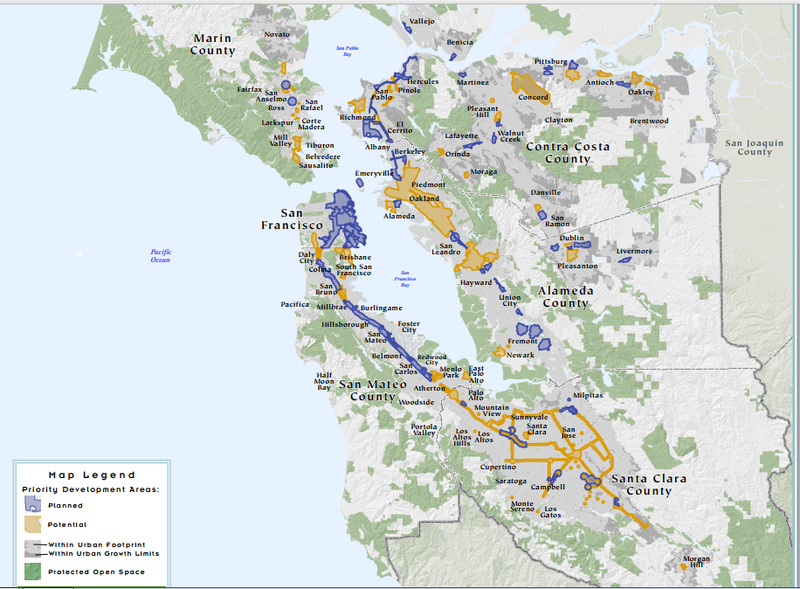 ABAG is responsible for allocating this state-determined regional housing need among all of the Bay Area’s nine counties and 101 cities. 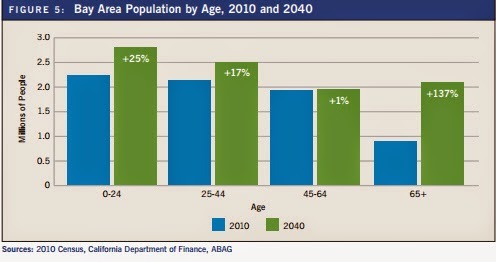 Factors used by ABAG in its allocation process include projected household growth, existing employment and projected employment growth, and projected household and employment growth near transit. RTAC - Regional Targets Advisory Committee - To assist ARB in setting targets, SB 375 calls for ARB to appoint a RTAC composed of representatives of MPOs; affected air districts; the League of California Cities; the California State Association of Counties; local transportation agencies; and members of the public, including homebuilders, environmental organizations, environmental justice organizations, affordable housing organizations, and others. ARB established the 21 member committee in January 2009 to recommend factors to be considered and methodologies to be used in setting targets. The RTAC delivered its recommendations to ARB in September 2009. The RTAC’s final report contains a number of recommendations on SB 375 implementation issues. One key technical recommendation is for the targets to be expressed in terms of a percent reduction in per capita greenhouse gas emissions from a 2005 base year. RTP - Regional Transportation Plan - Projects the funding that is reasonably expected to become available to the region through some planning horizon year at least twenty years distant. The plan then allocates funding to operate, maintain, and expand the regional transportation system, including roads and transit, that serve its jurisdiction. A master plan to guide the region’s transportation investments for a 25-year period. Updated every three years, it is based on projections of growth in population and jobs and the ensuing travel demand. Required by state and federal law, it includes programs to better maintain, operate and expand transportation. Once adopted by the MPO, the SCS will be incorporated into that region's federally enforceable RTP. SCS - Sustainable Communities Strategy - Demonstrates how the region will meet its greenhouse gas reduction target through integrated land use, housing and transportation planning. The heart of the SCS is a “forecasted development pattern” for the region, which will be informed by an inventory of existing land use throughout the region, as well as an identification of the parts of the region where future development can be concentrated, while still reducing VMT and GHG emissions. In order to realize the VMT reduction goal, development will need to be concentrated in the urban core and along high-quality transit corridors, including rail lines, major bus routes, and other prominent features of the regional transportation network. RHNA - Regional Housing Needs Allocation - A state requirement designed to ensure that cities absorb their fair share of the state's future housing need. SB 375 provides for closer integration of the RTP/SCS with the RHNA ensuring consistency between low income housing need and transportation planning. The state-mandated RHNA specifies the number of housing units (this cycle 2014 - 2022) for which each jurisdiction must plan in order to meet the region’s housing need at all levels of affordability. To better connect plans for housing and transportation, the RHNA must be consistent with the development pattern in the Sustainable Communities Strategy. Under the RHNA, the State Department of Housing and Community Development (HCD) uses population forecasts to determine each region’s future housing need. After issuing regional housing need determinations to Councils of Government (COGs), the regional government then distributes to each local government its fair share of the regional housing need, as a number of units that it needs to accommodate for that planning period. Local governments are required to update the Housing Element of their general plans every five years, in order to plan where and how it will accommodate its most recent housing allocation requirement under the RHNA. 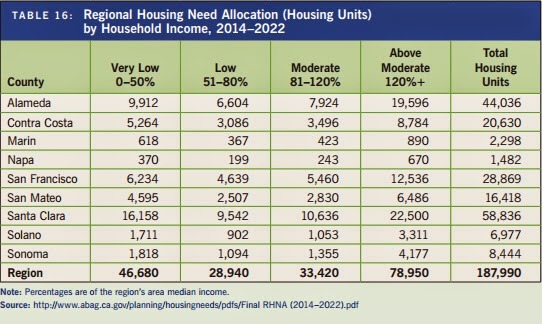 An important aspect of the RHNA is it requires local governments to plan to accommodate a specific number of units for a full range of income levels: very low-income (0-50% of Area Median Income), low-income (51-80% of AMI), moderate (81-120% of AMI), and above-moderate (over 120% of AMI). a reduced residential density alternative that would correspondingly reduce car and light-duty truck trips generated by the project. Transportation system management programs and policies. 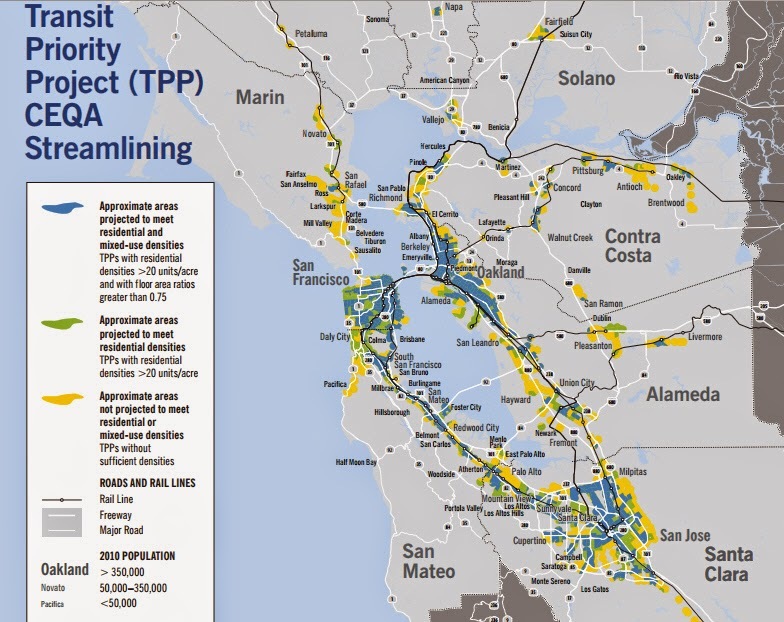 TPP - Transit Priority Project - A project that (i) has at least 50 percent of total building square footage as residential use, and if 26 to 50 percent comprises nonresidential uses, then the non-commercial floor area (FAR) ratio is at least 0.75; (ii) has minimum net density of twenty units per acre; and (iii) is located within one-half mile of a major transit stop or high-quality transit corridor that is included in the RTP. If a TPP meets a long list of criteria — these criteria speak to the project’s size, impact on natural and historic resources, energy efficiency, open space, and affordable housing component — then it may be eligible for a total exemption from CEQA. In practice, many or most TPPs will have difficulty satisfying the full list of criteria necessary for an exemption. It is easier, however, for a TPP to qualify for streamlined CEQA review in the form of a SCEA. VMT - Vehicle Miles Traveled - Automobiles and light duty trucks are responsible for almost 30% of GHG emissions in California, and transportation generally is responsible for about 40%. In order to address this substantial contribution made by passenger vehicles to the state’s overall GHG emissions problem, the State Air Resources Board (ARB) — the state agency charged with implementing AB 32 — intends to pursue three strategies. The Low Carbon Fuel Standard is expected to contribute 15 MMTCO2E of reduction, through 2020. Rather than reducing the impact of existing driving patterns on climate change, the goal of this third strategy is to change lifestyles and encourage less driving. ARB seeks to reduce VMT statewide by encouraging appropriate changes to the built environment that make it attractive for more people to take walk, bicycle, or take transit instead of drive. ARB hopes that VMT reduction resulting from more efficient land use patterns will realize about 5 MMTCO2E of reduction by 2020. SB 375 thus plugs into AB 32, by reforming land use planning in productive ways that will hopefully help achieve the desired reductions in GHG emissions. 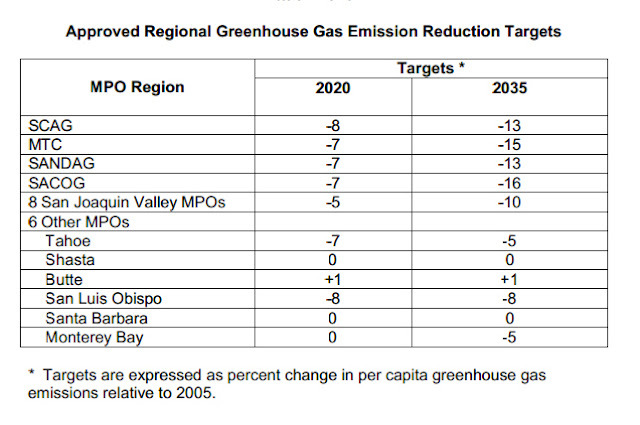 The final GHG reduction targets were approved by CARB in February 2011. Reduced VMT - One important aspect of the SCS is that it requires the MPO to accommodate all future population growth, including the need for additional housing brought about by employment growth, within its region. This requirement speaks to the issue of housing-jobs imbalance at the regional scale, a problem that encourages long driving commutes and thus increases VMT. One example of this phenomenon is how cities in the northern Central Valley, which feature housing more affordable than in the Bay Area, have emerged as “bedroom communities” that support jobs in the Bay Area. This has increased solo commuting along the heavily congested Interstate 580 corridor and increased VMT. The SCS attempts to deal with this problem by requiring that a region fully accommodate its own growth. Integrated Planning - Regional planning in California has generally been disjointed, subject to separate legal frameworks — regarding transportation, housing, and the environment — that have largely operated independently of each other, despite being clearly related conceptually. In the past, an MPO could decide to fund an expensive transit project — but because MPOs have no authority to zone or otherwise regulate land use (that power lies with cities and counties), the necessary funding would be allocated without a guarantee that sufficient housing would be built near stations to increase ridership and justify the investment of transportation dollars. Density Requirements - State mandates for density, housing types, and development standards are often in conflict with local land use policies and community values. This “one-size-fits-all” approach to Housing Elements is a major source of frustration for planning staff, elected officials, and residents of many communities. Property Rights - The opponents of the plan said they want to let the free market determine where and what type of housing would be built. One man stood up and shouted, "If we need stack and pack housing because there's a sufficient market for it, and people are willing to pay for it, it will get built without your intervention." Post Sustainability Institute Lawsuit - Filed on Oct 15, 2013 in Alameda County Superior Court. Claims the Plan — the Bay Area’s long-range transportation and housing blueprint adopted by MTC and ABAG to meet state requirements for reducing greenhouse gas emissions — violates private property rights as well as the California Environmental Quality Act (CEQA). This institute was formed to combat UN Agenda 21 which they see as an assault on liberty. Agenda 21 is a non-binding, voluntarily implemented action plan of the United Nations with regard to sustainable development. It is a product of the UN Conference on Environment and Development(UNCED) held in 1992. It is an action agenda for the UN, other multilateral organizations, and individual governments around the world that can be executed at local, national, and global levels. The "21" in Agenda 21 refers to the 21st Century. It has been affirmed and modified at subsequent UN conferences. The suit is pending in Alameda Superior Court and has yet to be considered. Bay Area Citizens Lawsuit - Filed August 2013 in Alameda Superior Court. Claims CEQA violations. Bay Area Citizens is represented by the Pacific Legal Foundation In July 2014, the suit failed in Alameda Superior Court. The judge upheld the Plan and EIR. Communities for a Better Environment, EarthJustice and Sierra Club Lawsuit - Claimed CEQA violations. The suit claimed the Plan does not spend enough on public transportation, and instead invests in building new highways. It argued the current Plan would result in more time on the roads and increased greenhouse gas emissions and fail to protect West Oakland and other vulnerable communities from the health effects of cars, trucks, ships and rail that pass through their communities. The Plan will also displace low-income and residents of color from their communities. In June 2014, MTC and ABAG settled with the Sierra Club and Communities for a Better Environment. Both agencies agreed to disclose to the public progress in getting housing built in city and county priority development areas and to explain how the plan measures and accounts for pollution reductions, among other things. Building Industry Association of the Bay Area Lawsuit - Claimed CEQA violations. The suit charged charging it effectively locks future workers out of the Bay Area housing market and relied on hundreds of thousands more commuting trips from outside the region. Settled in March 2014 with a commitment by regional agencies to end the practice of failing to plan for enough housing growth within the region. As part of the settlement, ABAG, MTC and BIA Bay Area came to broad agreement on procedures for forecasting job growth and housing demand, assessing the feasibility of planned development patterns and progress monitoring. The agencies also committed to a process that invites and discloses public comment when developing new strategies for the 2017 update to Plan Bay Area. SB 375 calls for periodic updates with the first one due to be completed in 2017. The lawsuit settlement would govern how the future updates are carried out, including forecasting, modeling and review of alternative approaches for meeting the region’s housing need. Tracking of building permit activity and construction, as well as market-demand and infrastructure-availability analysis, would be used to verify the feasibility of Plan Bay Area growth patterns. 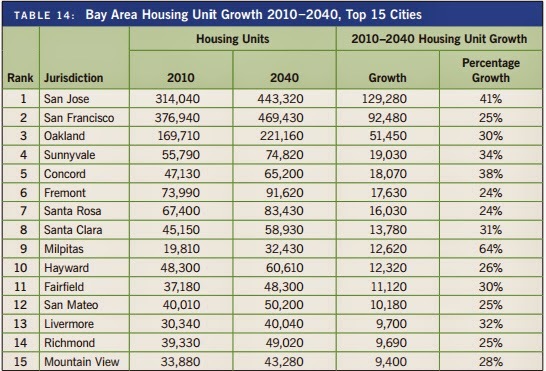 And crucially, according to BIA Bay Area, the settlement commits ABAG and MTC to identify areas within the region for enough residential growth in future iterations so as not to add to the amount of commuting into the Bay Area from other regions based on job-growth projections. Increased Intra-Regional VMT - If regional housing construction constrained. Shadows -High-rise apartment buildings could block sunlight from existing homes and possibly be an impediment to installing or using solar panels on residential roofs, among other issues. Target #1: Reduce per-capita CO2 emissions from cars and light-duty trucks by 15 percent. Target #2: House 100% of the region's projected population growth by income level (very low, low, moderate, above moderate) without displacing current low income residents. Target #3a: Reduce premature deaths from exposure to fine particulates (PM2.5) by 10 percent. Target #3b: Reduce coarse particulate emissions (PM10) by 30 percent. Target #3c: Achieve greater reductions in highly impacted areas. Target #4: Reduce by 50 percent the number of injuries and fatalities from all collisions (including bike and pedestrian). Target #5: Increase the average daily time walking or biking per person for transportation by 70 percent (for an average of 15 minutes per person per day). Target #6: Direct all non-agricultural development within the year 2010 urban footprint (existing urban development and urban growth boundaries). Target #9a: Increase non-auto mode share by 10 percentage points (to 26 percent of trips). 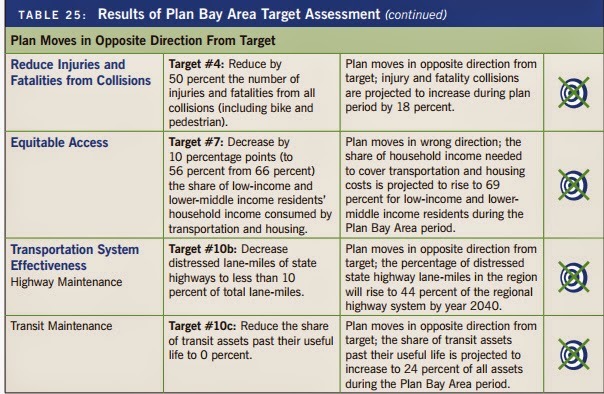 Target #9b: Decrease automobile vehicle miles traveled (VMT) per capita by 10 percent. Target #10a: Increase local road pavement condition index (PCI) to 75 or better. Target #10c: Reduce the share of transit assets past their useful life to 0 percent. El Cerrito, a small community between Berkeley and Richmond is an example of the sustainable cities business case. San Pablo Avenue (the original Lincoln Highway) is the city's main drag, The entire length has been defined as a PDA and the majority of future development in the city is slated for the avenue. City officials are seeking community input on a sweeping plan to guide development in its main transportation and shopping corridor over the next 25 years. The San Pablo Avenue Specific Plan could allow for more than double the current amount of housing in the 206-acre plan area that runs the entire 2.5-mile length of the avenue through the city. Based on Association of Bay Area Government projections, the development area has the capacity to add 1,706 housing units by 2040 to the 1,340 that existed in 2013. Commercial space, including retail, would rise far more slowly, from 2.02 million square feet in 2013 to 2.26 million square feet in 2040. Ray Pendro, who will help write an environmental impact report on the plan, acknowledged that projections show the city becoming more residential and more dense, with higher buildings, especially near its two BART stations. One-story retail and commercial space should increasingly give way to so-called mixed-use development that can sometimes have retail space on the ground floor with apartments and condominiums above, said Pendro, a project manager for MIG in Berkeley at an April 10 meeting at City Hall to gather public input to help in writing the EIR. Similar development is already in motion in El Cerrito with two such projects, Ohlone Gardens and Creekside, approved by the city within the planned development area. Ohlone Gardens is now under construction. The plan specifies a building height limit of 65 feet, but building up to 85 feet is allowed if a development meets certain state rules for affordable housing. Projections show the city becoming more residential and more dense, with higher buildings, especially near its two BART stations. One-story retail and commercial space should increasingly give way to so-called mixed-use development that can sometimes have retail space on the ground floor with apartments and condominiums above. The EIR will consider issues such as aesthetics, air quality, cultural and historic resources, noise and 12 other categories, that might be affected by development that might be allowed in the specific plan area. Shadows from tall buildings are not considered in the EIR and will be considered on a case by case basis. Details about the San Pablo Avenue Specific and Complete Streets plans are online at http://ca-elcerrito.civicplus.com/index.aspx?nid=396. One Bay Area is a new initiative meant to coordinate efforts among the region's nine counties and 101 towns and cities to create a more sustainable future. One major effort approved in July 2013 is Plan Bay Area, the region's long-range plan for sustainable land use, transportation and housing. BAAQMD - Bay Area Air Quality Management District (Also known as the Air District, since the acronym seems to take longer to say than the full name) - San Francisco - Regulates industry and employers to keep air pollution in check and sponsors programs to clean the air. The Air District also works with MTC, ABAG and BCDC on issues that affect transportation, land use and air quality. BCDC -San Francisco Bay Conservation and Development Commission - San Francisco - A state-established agency with jurisdiction over dredging and filling of San Francisco Bay and limited jurisdiction over development within 100 feet of the Bay. CARB - California Air Resources Board - Sustainable Communities requires ARB to develop regional greenhouse gas emission reduction targets for passenger vehicles. ARB is to establish targets for 2020 and 2035 for each region covered by one of the State's 18 metropolitan planning organizations (MPOs). ARB is also required to review each final SCS to determine whether it would, if implemented, achieve the greenhouse gas emission reduction target for its region. FOCUS - A regional planning initiative spearheaded by ABAG in cooperation with MTC, and in coordination with the Air District and BCDC. FOCUS seeks to protect open space and natural resources while encouraging infill development in existing communities (See also PCA and PDA). MTC - Metropolitan Transportation Commission: - Oakland - The transportation planning, financing and coordinating agency for the nine counties of the San Francisco Bay Area.